Ailsa’s travel theme this week is Glass. Over the past few years, Cardiff has seen a lot of regeneration. Whole blocks of the city have been knocked down and rebuilt. One of the most impressive, and modern, new buildings to spring up in the city centre is the Central Library, and it’s glass walls allow you fantastic views over the city. Housing 90,000 books, 10,000 CDs and DVDs, 10,000 Welsh language items, a dedicated floor for children (with the trendiest seating for them to relax and read in) and too many other facilities to mention here, Cardiff Central Library has been designed with everyone in mind. The six-storey building manages to stand out against all the other new builds around it. The area has changed so much that it’s hard to imagine where the previous library once stood. 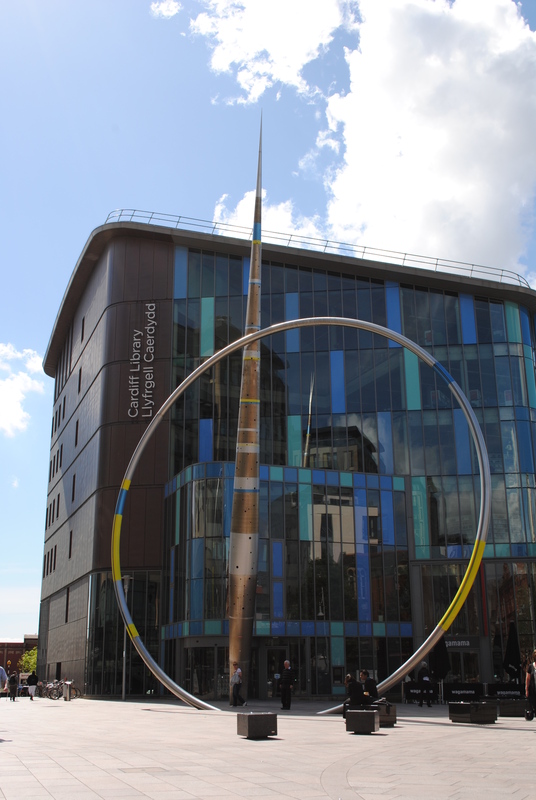 Cardiff library aims to be the first sustainable building in the city, one of it’s features being a grass roof which insulates the building in winter and prevents heat gain in the summer. It also assists in the removal of CO² and other pollutants from the city air. So cool! We have an unusual library here in Seattle too. Have been to the open air history museum in Cardiff three times, and I hope to go again one day.